Russell Finex self-cleaning filters for both industrial and sanitary applications offer an effective solution to your filtration requirements. Our Self-Cleaning Russell Eco Filter® improves your product quality by removing oversize contamination from 10 micron or above. Without the need for filter bags or cartridges and with significant reductions in wasted product over traditional filters, our range of industrial filters are both cost-effective and environmentally friendly, hence their name “Eco Filters”. 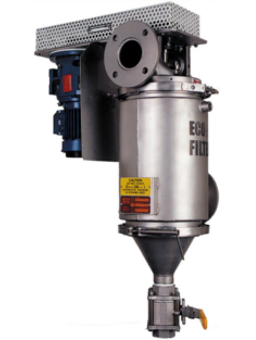 The Self-Cleaning Russell Eco Filter® uses a unique SpiroKlene™ system which continuously cleans the surface of the filter element and ensures optimum filtration efficiency. This allows for high and consistent flows, which are ideal for filling operations and continuous production lines. 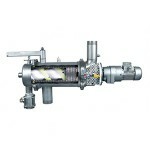 The range of self-cleaning filters is designed for ease of operation and maintenance. They are simple to disassemble and clean without tools, allowing for fast and efficient product line changeovers, therefore increasing productivity. The units fit neatly into existing production lines, providing considerable filtration capacity without requiring excessive space. 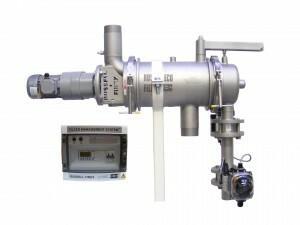 400 and 600 series: This model utilizes the unique self-cleaning functionality of the Russell Eco Filter® but with the inlet and outlet in the same plane. This makes them even easier to fit into existing pipework. Horizontal orientation: The Russell Eco Filter® is available in horizontal orientation to suit different installations and to improve accessibility even further. 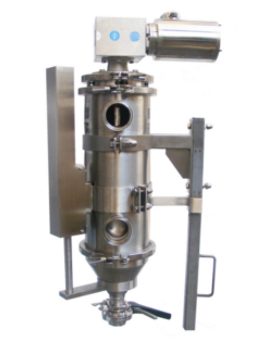 A high-specification Russell Eco Filter 803 designed for optimum cleaning, meeting the demands of the food and pharmaceutical industries where product quality cannot be compromised. Fully enclosed filtration of high temperature liquids such as resins and cooking oil to safeguard operators. Fitted with an offset drive, self-cleaning wiper system and heating jacket. 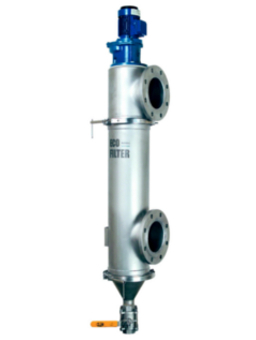 The largest filter in the range suited to high flow applications such as effluent or water filtration, providing accurate filtration levels down to 25 microns and achieving flow rates of up to 200,000 l/hr (50,000 g/hr) whilst providing consistent high product quality. Continually monitor and control a liquid filter efficiently without operator involvement, resulting in reduced labor costs and increased productivity. Contact Us for more information about our filtration systems. "Compared to our previous manual filtration system, the enclosed Eco Filters have allowed us to achieve good housekeeping and reduce labor costs."